by the Rotary Club of Lyme Regis with Lyme Regis Town Band. Thursday 26th Boxing Day Go for long walk! from the sand beach organised by Lyme Regis Rotary. After 38 weeks of demanding work, the Lyme Regis Boat Building Academy Class of February 2019 are launching their boats for the first time. The students are building new build boats, all of which will be lined up for launch. Royal Mail will send a letter from Santa Claus for free. If you are hoping for a reply from Father Christmas, post him a letter by Friday, December 7. Send to: Santa / Father Christmas Santa’s Grotto Reindeerland XM4 5HQ Make sure you include a full name and address so Father Christmas can write back. is a chance to see artworks from the Lyme Regis Museum’s collections not normally on display that were inspired by the countryside beside and behind the Jurassic Coast rather than the more usual town and coastal scenes. On view will be prints, posters, watercolours, oils and some photos dating from the 1790s to the 1990s, from Charmouth to Uplyme with some inland Lyme views as well, made by local and visiting artists, both professional and amateur. Sunday 9 December at 4pm. For the first time, St Michael’s Children’s Choir will join the adult chorale for several parts of the concert, with some children singing solos in an arrangement of ‘Good King Wenceslas’ by Paul Halley. The children will also sing in ‘Christus natus est’ by Cecilia McDowall and ‘Ding dong merrily on high’ arranged by Mack Wilberg. Lyme Bay Chorale will perform the Poulenc ‘Gloria’ – with soprano solo by well-known local singer Chloe Stratta – and two other pieces by Paul Halley: ‘Infinite light’ and ‘Watt’s cradle hymn’. There will also be several audience carols. F irst started in the late 1950’s this hugely popular event has been run every year since. 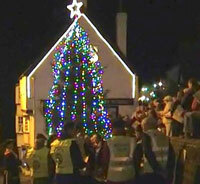 It attracts hundreds of people who gather round the splendid Christmas tree at The Shambles and sing along heartily, accompanied by music from the Lyme Regis Town Band with the Town Crier as MC. Come along and join in what is a truly enjoyable evening and delight in seasonal fare: mince pies and hot soup. There will be a collection in aid of charity. A fancy dress dip in the balmy waters of Lyme Bay, 13.00 hours at the Cobb Beach, (gives you time to watch the duck race first) all for charity. Everyone welcome, whether ‘dipping’ or contributing to our charity collection. “If you would like to raise funds for the chosen Rotary charities please feel free to use the attached sponsor form, where sponsors can sign up to Gift Aid if they wish. If you have your own charity which you wish to raise funds for then please go ahead. Get Fossiling on the Jurassic Coast! Join one of Lyme Regis's famous fossil walks along this historic stretch of Dorset coast with Geologist Paddy Howe and Marine Biologist Chris Andrew. Some families return time and again to search with Paddy and Chris among the sand and rocks for fossils that have been washed down onto the beach after 190 million years. For adults and children alike, it’s an unforgettable experience.